I just sat for the Chartered Market Technical Level II exam. The test prep materials beat the drum on non-correlated assets. Assets are non-correlated when they do not move together with any statistical significance. Gold and stocks are notorious examples of non-correlated assets. Gold is driven by supply and demand, interest-rate changes and investor sentiment. Stocks are driven by earnings season, economic growth and the business cycle. With the volatility in U.S. stocks these days, more investors are taking a fresh look at gold. And one indicator suggests that diversifying into gold will soon pay off. The gold futures chart above includes a key indicator at the bottom called the Directional Movement Indicator (DMI). Simply, it measures price direction. Positive directional movements (DMI+) are combined with negative directional movements (DMI-) to produce the Average Directional Index, or ADX. When ADX is rising, the underlying price is in a defined trend. When it is falling, the trend is deteriorating. Everyone wants to know when a trend is poised to begin. No one wants to get in at the middle … or worse, at the end. That’s why I like to use the DMI as an early warning. Let’s look at gold’s most recent downtrend, which started in May. 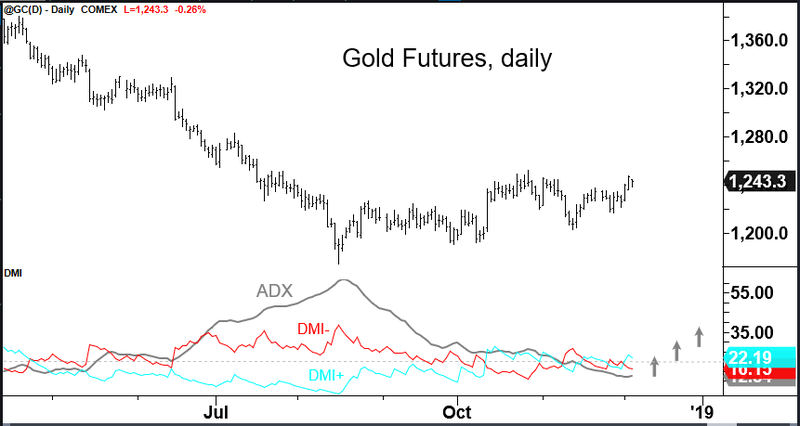 Gold’s trend began when the ADX line rose above 20. It ended when the ADX line peaked in August. Since that peak, gold has gained some ground. The falling stock market and investor fear deserve some credit for boosting the price of gold. And shifting expectations for future Fed rate hikes are likely to support prices going forward. The Fed Chairman suggested last week that rates might not need to go much higher. Gold does not offer a yield, so when rates are rising it struggles to compete with assets that do. No doubt, signals from stocks and Fed watchers will be mixed in the weeks ahead. But an indicator like the DMI might give us an early warning that gold is about to begin a new uptrend. First, has the ADX line crossed above 20? That level indicates a solid trend is beginning. After that, has the DMI+ crossed above the DMI-? When DMI+ is higher than DMI-, the bulls have the advantage. And vice versa. The price of gold is looking strong. The DMI has not yet triggered a buy signal for gold. But it’s getting close. « Previous Is Microsoft the Next $1 Trillion Company?